Our theme this month is Christmas or any other Winter Holiday. Our designers are showcasing lots of gorgeous projects. If you have arrived from Angela's blog, you are in the right place, if not why don’t you start on the From the Heart Stamps blog, so you don’t miss anything. Thanks for hopping with us today. The hop will end on Monday December 8th, 6 am EST. Winners will be posted on the From the Heart Stamps Blog on Wednesday December 10th. Stunning tags! Your vibrant coloring is gorgeous, as always, and the glitter accents are perfect!! Just WOW!! They are great. 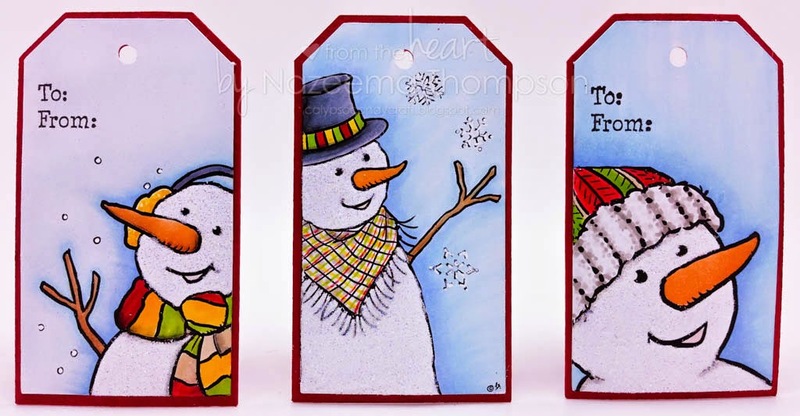 The glitter on the snowmen makes them look so textured (LOVE it) and your coloring just always amazes me. I feel inspired to get some tags done - great idea!! Great set of tags! Love the texture of the snowmen...it looks like real snow! Beautifully finished tags. Love the coloring and glitter. These tags are fabulous Calypso!! So cute Nazeema, and colored so well! Oh My! What FABulous tags these are. LOving the sweet images and pretty colours. I always say that I'm going to make my own tags ... but after making all my cards, that never seems to occur. Yours are stunning. Seriously pretty! You are an inspiration! Beautiful tags. Love the images. Great tags and another way of using the image. Wonderful coloring and great tag idea! Fabulous idea to make tags with this image. They looks really great !! Oh my goodness these are fabulous!! What a great idea!! Thanks for being a part of the hop! Merry Christmas to you and your family!! Adorable with a capital A!!! What a fabulous idea to make tags. And these snowmen are the sweetest. Oh my... these are gorgeous. Love those snowmen in closevup an your coloring is awesome. Wow! Fabulous coloring and great design. Love! Calypso, these are super cute. Gorgeous coloring.